Should we start panicking if we just have a booking history. Working away from London and on multiple weekends means i can’t attend regularly, and therefore am not a season ticket holder... does that make me any less of a fan? I hope not, but seems like I might get punished for it. I’d be devastated if I can’t attend. Possibly the 5 tickets available for each person may have been too generous from the club. Same here mate, and have family history back before Sir JH as Fulham through n through incl being there in the ‘bad old days’. Yet new sth are allowed5 tickets - not sure they have this right, although it must be really difficult for the club. Oh dear, I feel your pain. Would be such a shame not to be able to go. Seems like there are a few of us in this predicament. Hoping for the best as was able to get Hamburg tckts! Also think that there could be many people there that are just family/friends of a sth that are not really committed to the cause, thus possible reduction in support/atmosphere for the Mighty Whites? It’s effectively a cup final and one of the biggest matches in our history, even if a fraction of our fans make the noise we did on Monday there will be a cracking atmosphere. Anyone that is Fulham through and through will have no problem getting a ticket for this match. Ok, with less than a couple of thousand extra ST holders joining the process tommorow and 23k sold from 10500 ST holders you can see that there is plenty of room for people yet to get tickets. As expected nowhere near an average of five per person have been taken up. As I said elsewhere, if you want to go you will be able to. But only upper tier tickets are left! Why do STH get 5 tickets on Wednesday and members the remainders on Saturday? Guess there are few members having attended more matches this season than some STH. Furthermore, dedicated ticket platforms are already full of tickets for horrendous prices. This system is questionable. Giving 5 tickets to members could be asking for trouble, seeing that Villa only have 1 ticket per STH. With close to 16,000 left though after the busiest day of sales, I struggle to see us selling out though. Think 5 per S/T holder was too many should have been2 per holder! Five was too many. Two or three would have been more appropriate. I'm a member with over 300 points, who lives abroad and travels to games. If I get a ticket on Saturday, I'll be pleasantly surprised/delighted. Will opt for the hospitality tickets if I don't. Spoke to another lad I know who travels to games and he decided to buy his from a ticket site after seeing the way tickets were being allocated. No intention of going down the route myself. The horse has bolted on that one. Take a look at the unofficial tickets sites. I know a few Villa fans and they say that every Villa fan who wants to go will get a ticket in their end from their club. Out of interest, anyone know how many members we have? Can't be that many surely, which is why I think there will be plenty left come Sunday. Then the system just needs to weed out the booking histories with Villa games only - there will be a few of those from the 'neutral' end. We had a massive amount of member's in the premier league, can't remember a figure. But sure it was a few times more than of season ticket holders. Only top tier tickets left ,it's disgusting that some sth have made profit and sold them on they have ripped off hello supporters. You had to be a member in the Prem to get tickets to most of the games - I was a member, but in the Championship, tickets are usually easily available - so a lot less members I would think- I'm not a member now, unfortunately. 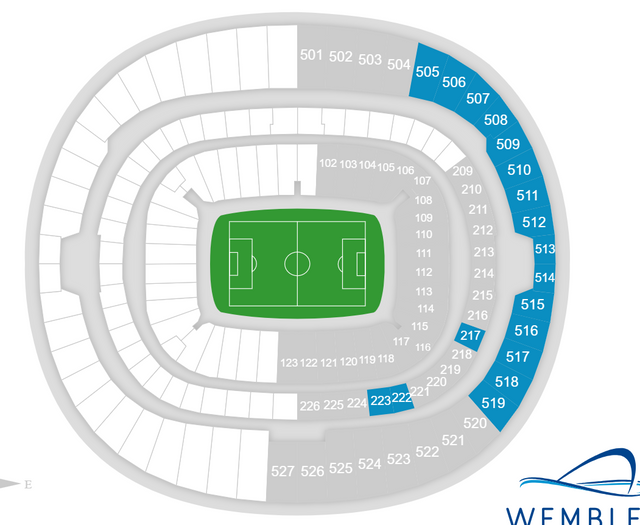 Morning update, Blue sections in the image are on sale with blocks 520-527 still to be released which I reckon are about 7/8k seats. 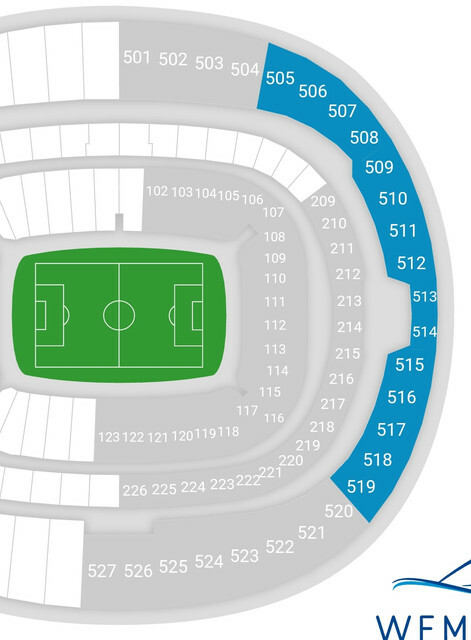 Many of the blue blocks on sale still have 3/4 or 2/3 of seats available to buy, certainly the higher number ones. I reckon there will be tickets on Sunday for sale. Hope the image works, but showing that there are now some seats available in 217, 222 and 223. A few singles and even a couple of pairs popped up. Do we think this is secondary to the club identifying third party tickets and revoking the ST holder that bought them?